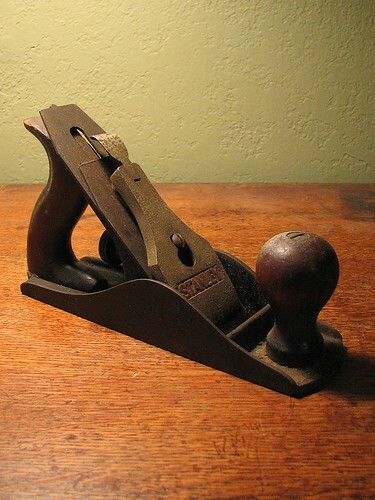 As Mac and iOS craftsmen we’ve been given a new tool. In some ways it looks a lot like the old tool, a tool we’ve been using for many years now. In many ways it is very different. This tool is, of course, the Swift programming language. A strict type system is one thing that differentiates Swift from Objective-C. This type system, along with other related features like generic types and custom operators, has started a movement among developers to adopt some techniques that Swift’s predecessor made difficult or impossible. Some of these language features and techniques come from the language Haskell, one of the many languages Chris Lattner drew inspiration from in creating Swift. As I try to learn and adopt these new techniques I feel a bit like a woodworker who’s been given a new tool, one with new features that I don’t completely understand. One trick I’ve learned is that with such a strong type system comes certain affordances. Optional has a method called map. Now if you’ve used map functions that are common for collection types you might be able to intuit what this map function does. An Optional isn’t an array, however, so it might still be a little confusing. But if you take a moment to inspect the type of map you will see the trail of breadcrumbs. Here we can see that map takes a single function from (T)->U as a parameter and returns an U? (which is just nice syntax for Optional<U>) as a result. Remember that T is the generic parameter type of the Optional on which you are calling map. This effectively allows us to take an object wrapped up in an Optional context and apply a function to it resulting in an Optional object of the given function’s return type. Higher order functions like map are common in functional programming languages. For example, Haskell defines a function fmap that performs the same operation as Optional.map. Haskell programmers use this function so often that they’ve even given it an operator: <$>, and many Swift programmers are following suit (though, due to some limitations on special characters in Swift, most implementations seem to have settled on <^> for that paricular operation). When confronted with new symbols and unfamiliar techniques for solving problems in a strictly typed language like Swift, I find it helps to follow the types. Photo by Seán A. O’Hara. Licensed under CC BY 2.0. Derrick Hathaway is a Sr. Mobile Engineer at Instructure. He is currently working on making Instructure’s iOS apps more awesome!